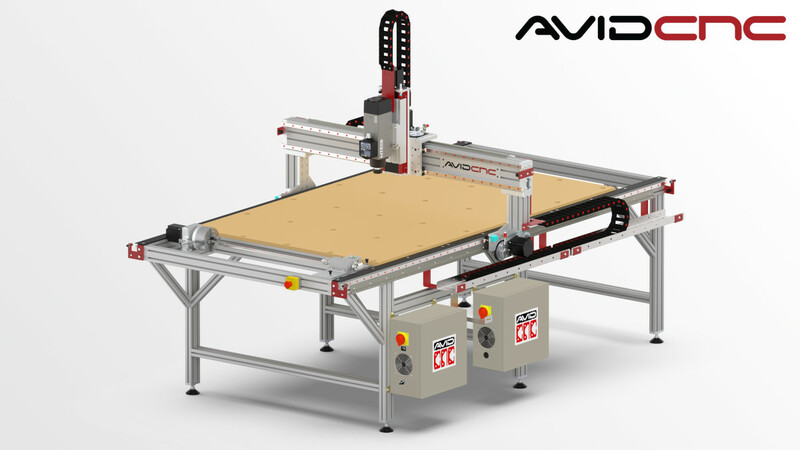 Garage CNC Cutting Table revolution. All those home build boat projects you were thinking of building suddenly become possible. Just talked to my son who has an IT degree, and it took him one week to develop a square PC case in sketch-up, and 3 weeks to get rid of the errors and bugs , and that's for a square box . Apparently developing curved surfaces is very complex , and transferring the cutting code to router on large surfaces like a 8x4' difficult to achieve with good accuracy . I suspect he may not have the best software. The decent stuff can cost as much as he paid for the table. However he should find a forum to look for assistance on best ways to design and program these hobby tables. It requires a parallel port from a pc to control the drive axis motors, I havent seen a parallel port on a pc in quite a while. They warn about the Z axis being flimsy as well when working with wood. ..and the free software doesn't have the facility to develop curved surfaces acurately. I think we're a good way off 3d printing large objects yet; maybe it's the same story with 2d CNC cutting ? If you want to see one of these in action check out U-tube 'SVSeeker' a guy has been building a 70' steel boat semi-sail ,but he has used it to make all sorts of parts for his construction. He replaces the router with a plasma cutter and is cutting port hole parts , deck knees, . With the router he is cutting everything from 10" dia plastic parts for rudder bearings, and casting patterns for propeller blades then casts in bronze! He has a unique style and attitude but he get lots of volunteer help. You won't agree with everything they do but he is getting it done! And all in OK. Check out about 1/2 way thru. Also you can get much smaller version of a router table to make small parts. That table is only about 1/3 of what you will need. You still need a table top, hold-down system, dust collection, and electronics. I'll bet the total will still be over $10,000. and you still do not know what the accuracy and repeatable will be. That sounds a bit like building a boat , the hull is just 1/3 of the total cost. I've noticed many boat plans that include cutting files are very expensive compared to the old fashioned lofted offsets, makes one think that it ain't that simple to generate the vast amount of data needed to develop compound curves. The table is just basically a variation on a cnc milling machine. But just intended for large panels with a short Z or vertical axis. Tolerances are not the same as with a heavy cast iron mill like we use but for most boatbuilding it's plenty good enough. Check out the TV films of building of cruise ships. They cut huge quantiles of steel parts with very large tables using plasma underwater to reduce distortion and oxy acetylene cutting for the less critical stuff this has been arround for 40+years. It's the cheap small units that run off a PC with simple to use software that make these great for small builders. Some programs allow you to use a simple 2D line drawing (.DXF) and the cutter head, whatever type you fitted, to follow a line. Easy stuff! It gets harder from there! 3D printers do the same sort of thing but the finished piece is only from plastic with limited durability until you get into the fancy stuff. Would it be possible to errect frames from a set of plans, then make accurate templates with thin plywood or cardboard; these patterns could then be laid flat to develop the .DFX cutting files . It sound like you are over thinking the frames. Remember they are just simple flat panels which can be drawn from the imformation on the lines plan. Drawing in 2d is not to hard. There is no need for 3D drawing. Now if you are trying to reverse engineer an existing design or boat then you need to take a set of offset ( dimensions) from the boat and then draw in a computer to develop the ?DXF file to use on the cutting machine. If it was me trying to build a wood boat I would take the .DXF Files to a water jet cutting machine and have them cut all the frames in Plywood . It cuts wood so fast it would not be very expensive and super accurate. If you want to get into drawing your own panels some programs are much easier to work with than others. The other thing you might be asking about its making hull panels which are curved and then convert them to a flat panel. That is a more difficult process. But can be done. I've been reading up on how to build in aluminium , and they recommend a 1.5mm gap between the plates; anything more and the weld will become brittle , and it seems that gap filling isn't possible like it is with steel fabrication . The design I'm interested in comes as full size frames on paper, but they expect you to develop all the hull plating yourself with templates. How would you digitize the hull panels? To creat the shape you will have to draw the hull In 3D from the frame drawing dimension assuming they give you dimensions and not just the full size frame patterns. They probably want you to make templates for the hull skin from the frames after you have set them up. The accuracy of you set up will determine whether hull panels developed in a 3 d file will actually fit. Unless you really want to go that route would it just be simpler to make the templates directly of the frame set up as normal? Or alternatively buy a design that was designed in 3D and have all the panels , frames and parts pre cut to accelerate the build process. The plan is to build the small 23' design as an experiment in alloy construction, then build a bigger 10-12mtr version. My cunning plan was to stretch the smaller boat , with the input of the NA of course, but save the $3-5k they charge just for the digital files. Looks like a fun project, you could save the cost of building the small version and put it into the design of the larger tug! There are boats out there like the Ranger or Nordic tugs with a performance hulls that look like tugs but plane! I'm sure there are other designs out there . I would search the Older designs of Akins or Bolger for inspiration. And i thought I was fancy having a plasma cutter in my garage.